Customer returns for a fuming hardwood floor update! This Phoenix homeowner originally came to us in 1987 wanting to install a hardwood floor that would stand the test of time. The original founder of our company Jim (remember we are 3 generations of hardwood flooring installers here) suggested a random width white oak hardwood plank, in which Mr. and Mrs. O seemed to love. We then installed, sanded and finished the white oak to the design standards of the times. That seemed to suit the homeowner for quite a while, but then in 2001, they came to us wanting to update the color and restore the finish of their hardwood floor. So once again our sanding and finishing crews went to work on Mr. and Mrs. O’s house for the second time and this time updating the color and the finish to the looks of the early 2000’s. Fast forward to 2017, we once again got a call from Mr. and Mrs. O. They told us they were ready for another update. They had tried to have another company sand and finish their floors but were not happy with the outcome. They did not like the quality of the sand job and really could not stand the yellow high gloss finish. The Phoenix homeowners said they wanted an updated low gloss look that resembled the look of an old farmhouse. Luckily, for us, we knew exactly what to do. We had recently picked up Rubio Monocoat, a hardwood finish that protects and colors in one single step and has unlimited color and pretreatment options. The homeowners told us they wanted gray tones as well as the look of natural wood flooring while we were on the phone with them. We then asked them to come see us at our warehouse location because we had recently finished a floor we thought fit the description we were given over the phone. Mr. and Mrs. O agreed to drive to all the way across town to see us. When they walked in we showed them a white oak hardwood floor we had just fumed with a pre-treatment using Rubio Monocoat and then finished with the Rubio Oil Plus 2C to colorize and finish in one step. Well, they basically fell in love with it immediately! They held their cell phone up with a picture of the floor they had envisioned and set it on top of the sample. It was perfect! The next question was when can we start? We got started the very next week. Walked into a job another company left half way through; the floor was finished in high gloss, extremely sticky, finish. Using our Bona dustless sanding system our sanders had to cut the floor with several different grits of paper before we could get all the finish off the floor or get the floor flat and smooth enough for proper finishing. After the floor was sanded smooth we tacked up the dust and began to fume the hardwood floor with a pretreatment from Rubio Monocoat. View the complete video here. 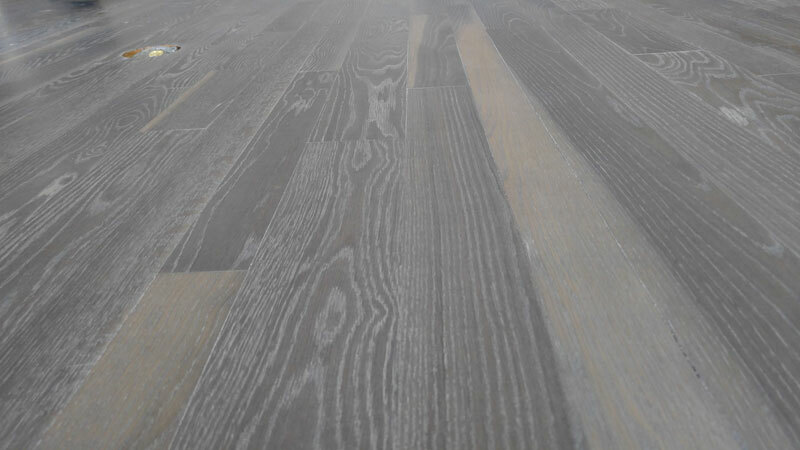 This fuming process is amazing to watch as natural hardwood turns to gray aged looking boards and keeps a natural varying tone throughout the floor. This process makes each floor treated with it truly unique from any other. After the fuming, the floor needs to set 36 hours to fully cure. We then neutralize it by wiping it with a damp cloth and then buff on a Rubio Monocoat oil plus 2C in a special white mixture. The transformation was drastic and floors turned out wonderfully! Most important we have long term clients who once again loves their Arizona Hardwood Floors! If you would like to learn more about fuming hardwood flooring or any of our other hardwood flooring installation services, call (623) 742-9663 (WOOD) or stop by one of our convenient Valley locations.